*** EDIT *** For the folks who prefer CAP Sweet Strawberry, you can sub it in place of the FA Juicy Strawberry at same percentage for a brighter top note. TPA Strawberry Ripe: the top note strawberry flavoring (new version). 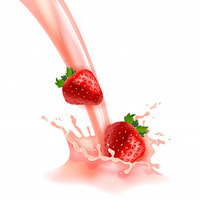 FA Red Touch Strawberry / FA Juicy Strawberry: the Red Touch adds a slight jamminess while the Juicy Strawberry adds a bit more brightness to the top note strawberry - best used in small percentages in creams. FA Cream Fresh / FLV Cream: this combo in equal parts is perfect for milk. The Cream Fresh provides the dairy notes and the FLV cream helps create a thicker body. CAP Vanilla Whipped Cream: adds a light fluff and vanilla to the dairy body without compromising overall vape density. FA Meringue: more dairy, sweetness and creaminess in a S&C... is it a bad thing? FLV Sweetness: obviously optional but I find it best used low in this mix. This recipe is the property of dioblanblu and released under the CC Attribution-NonCommercial-NoDerivatives 4.0 license. You may not copy, derive or commercialize this recipe without following the terms of this license or the explicit permission of the creator. This was a good S&C. I let it steep for over a month. The strawberry is a little light for my taste, which I expected, but it is a lot brighter than I thought. I can taste the strawberry for sure with a very thick cream base. The creams are layered very nicely. I might bump up the juicy and red touch a bit. Overall it's really good!